College is THE TIME to start a blog. With all the new experiences you’re having, new friends, relationships or lack-of, drama, school, and everything else you have going on, you have a lot to write about. I mean, when else in your life are you going to have this much craziness? 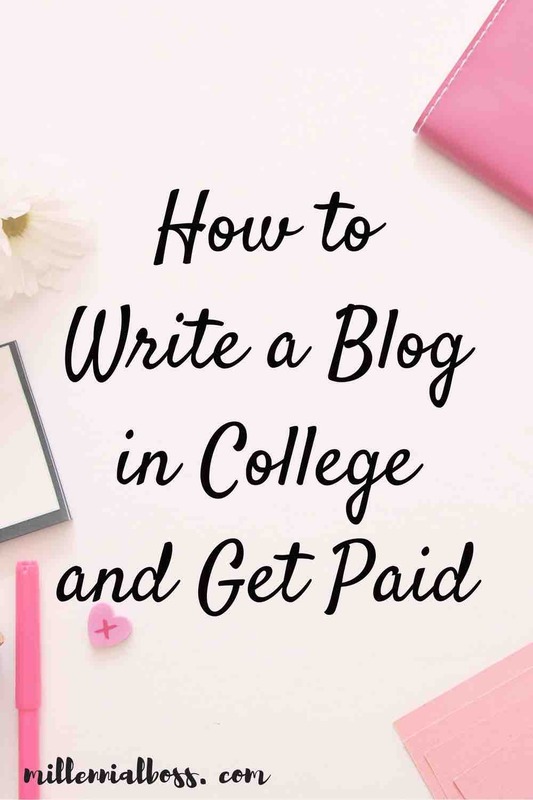 I’ve put together a list of everything you need to know to succeed as a college blogger from how to start a blog, to how to drive traffic from Pinterest, to how to make money from your blog. PS – I’ve made over $12,000 on my blog in the last 6 months! Don’t believe me? 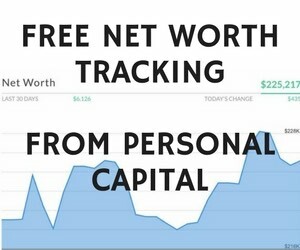 Check out my latest online income report. Or this massive list of bloggers making $1,000 to $300,000 per MONTH. You can get there too, you just have to start. 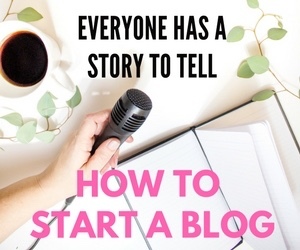 Below is exactly how to start your blog. Thinking about starting a College blog? first wanted to share why I’m so passionate about blogging. 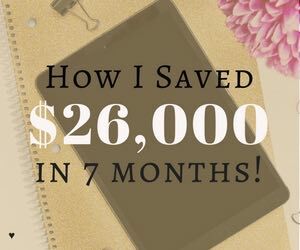 This blog has allowed me to do amazing thing such as paying off $89,000 of student loan debt or saving $26,000 in 7 months. Blogging can help you too. Here are some of the ways blogging can improve your life. 1. Blogs are the diaries of our generation. Balancing school, work and everything going on in your personal life is really hard. Blogging gives you an outlet for that stress and turns it into something good. 2. Blogs allow for creative expression. Blogging gives you a chance to show the world who you really are. Through your posts and social media accounts, you can tell your story and showcase your personal style, opinions, dreams and ambitions. If you write a post about something difficult you have gone through, someone else who is going through that exact same thing might find your post and feel a little better. You have the opportunity to change someone’s life through your blog. The top jobs and internships are so competitive but having a blog can make you stand out. You will learn digital marketing and social media skills that you can add to your resume. Companies today know they need to reach customers online and need employees with digital skills. I earned an internship with the U.S. Olympic Committee because of my first ever blog I wrote about study abroad. I made so many friends through my blog! If you start a blog, you will quickly find out how nice the blogging community is. Connecting with other bloggers on social media is fun and you can help answer each other’s blogging questions and promote each other’s content. College is ridiculously expensive and too many students are graduating with student loans. 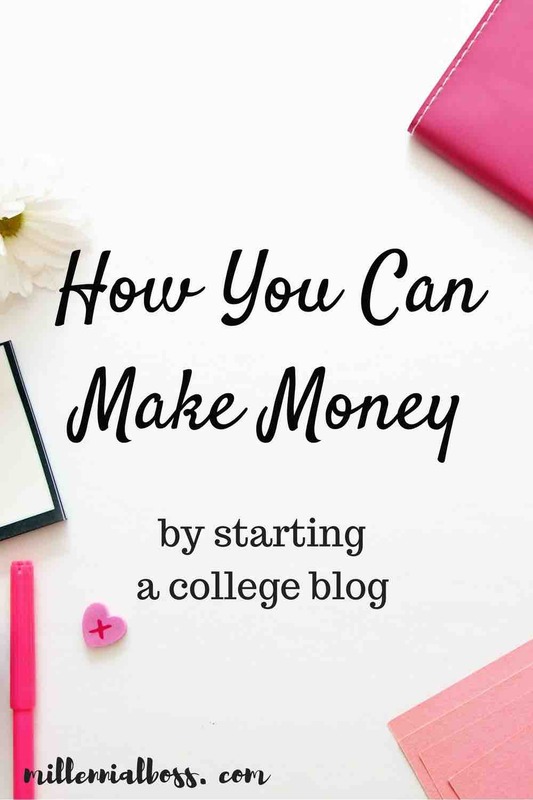 Blogging can be a way to pay your way through college. I started making money on my blog this summer and it changed my life. I was surprised to find out that it’s not that hard to make money on your blog. I’ll get into exactly how to make money on your blog later in the post. This post details EVERYTHING you need to know to start your college blog but you may not have time to read it now. Sign up for my FREE email list below and get my 7-day free start a blog course emailed directly to you. If you’re thinking about starting a blog, bookmark this page. 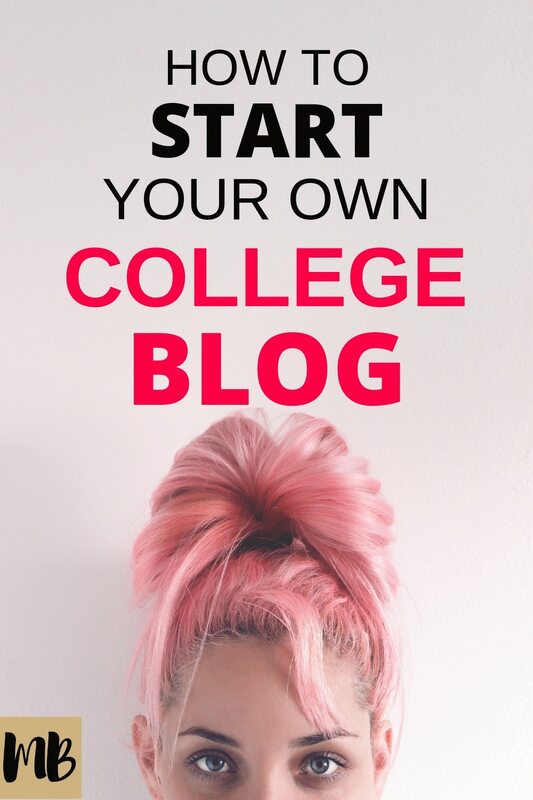 I’m going to tell you everything you need to know to start your own college blog. Think of your blog as a collection of pages and pictures. Those pages and pictures need to be saved somewhere on the internet so that anyone can access them. Hosting companies offer to “host” your pages and pictures on their computers (servers) so that people across the globe can access them. That is why you need a hosting provider when you start a blog. I personally recommend Bluehost for your hosting provider since they are cheap and make it really easy to setup your site. I’ve been using Bluehost on my blogs for years. Choose the cheapest hosting plan Bluehost offers. You want to be blogging for less than $5 a month. Picking a blog name (AKA domain name) is the fun part! Pick any name you want! You can’t choose a name that someone else has already used but luckily Bluehost makes it pretty easy to search and see if a name you want is taken. Most bloggers recommend going with a .com domain name but that is personally up to you. A blogging platform lets you create the basic structure of the blog. I like to think of the blogging platform as the basic frame of a car. It’s the engine, wheels, and all the boring stuff that every car has. It’s not the convertible top or the fancy red paint or the leather seats. You need a blogging platform to lay the basic foundation for your blog and then you can customize on top of that foundation. Most bloggers use WordPress for their blogging platform. If you go with Bluehost, you can download WordPress as part of the setup process so you don’t even have to worry about this step. So here is where the fun comes in. If WordPress is the basic frame of a car, then the theme is fun customization. You can have the Ferrari of themes or you can have a Toyota Camry of themes. Themes determine what your blog actually looks like to a reader. If you’re like me, you’ll want your blog to look awesome. You can use a free theme but it may not look as good as a theme that you pay for. Paid themes are also easier to setup, especially if you don’t know coding. Going with a paid theme saved me a lot of time building my blog. I saved up and purchased the theme for this blog through StudioPress. You can look at demos of all of the themes they offer to see which look you like the best for your site. Studiopress also offers a step-by-step tutorial to setting up their themes which makes it super easy. Secure your blog name on all of your favorite social media accounts. I highly recommend you create a business account for your blog on Pinterest. If you ever try to make money on the blog, you’ll need to increase your visitors and Pinterest is a great way to do that. Later on in the post, I’ll tell you exactly how to use Pinterest to increase traffic to your blog. It might help to pick a focus for your blog from the beginning. Maybe you’re going to write a college lifestyle blog or a fashion blog or a how to be healthy in college blog. Or, maybe you don’t want a theme to your blog at all and just want the freedom to write about whatever you feel like at the time. Whatever you want to do is fine, it’s just super helpful to come up with a game plan or direction for your blog before you get started. This direction can help guide each post and help prevent writer’s block. If you’re using WordPress for your blogging platform, click on plugins in the left side of your dashboard and search and download the following. These plugins are all free. Askismet – this protects your blog from spam. You’ll need this plugin to filter out the robots. Commentluv – this allows other bloggers to link to their most recent post when they comment on your blog. Bloggers love promoting their own content and it will encourage them to leave some comment love on your site! Shareaholic – Highly recommend using shareaholic so that you can add social share buttons to your posts. If someone loves your post, they can easily share it to Facebook or Twitter. Simple Social Icons – Use this plugin to add your blog social media accounts such as Facebook, Twitter, and Pinterest to your home page. You want to draw your readers to your social channels. W3 Total Cache – This plugin makes your site faster. No one likes a slow site. Yoast SEO – Have you heard of Search Engine Optimization or SEO? This plugin makes it easier for Google to crawl your site and will ultimately help you bring more traffic back to your site. The next step is to write some posts and start making money. Keep reading to learn how to do that. So here is the good stuff..how I make thousands of dollars per month blogging. Did you even know you can make money blogging? Most people don’t start their blogs to make money but some have used their blogs to pay off debt or create side income. Who doesn’t need a few extra dollars in college for clothes or going out with friends? Here are 3 steps you can take to make money on your blog. Do you use Pinterest? I always used Pinterest for personal use but never thought about using Pinterest to grow my blog. 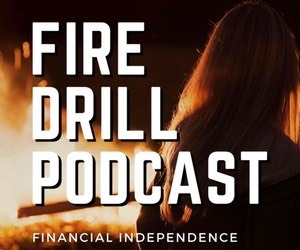 A few months ago I started adding a vertical Pinterest image to every blog post and saw my traffic and income skyrocket. In two weeks, I had over 8,000 visitors to this post I wrote on saving money. Here are 12 tips I learned on using Pinterest to grow your blog. Create 8 boards that are relevant to college students and pin 8 pins to each board. Write a really interesting description for your profile and for each of your boards. 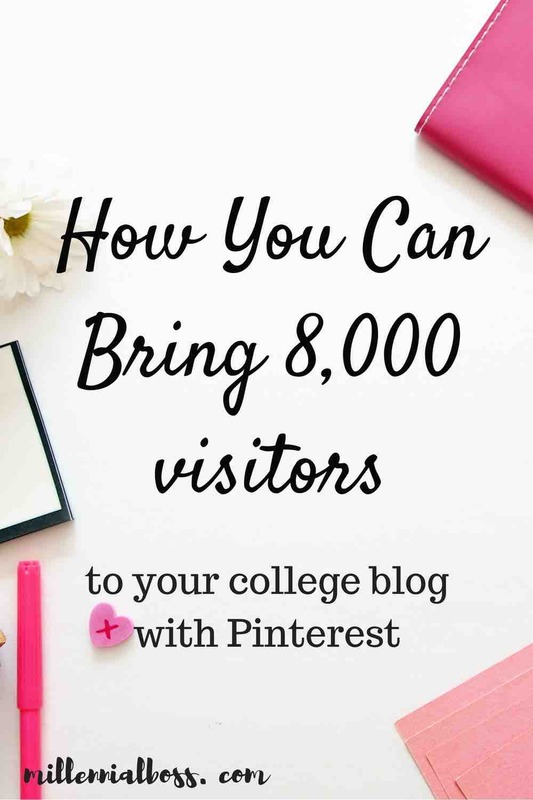 Find and start following other college bloggers on Pinterest. Find and start following group boards that cater to college students. (Group boards are boards that multiple Pinterest users can pin to). Ask to join any group boards that are accepting new contributors. (Typically you should email the owner of the group board and ask to join. Their email address is usually listed in the group board description). Pin your own content to those group boards daily. Make sure to follow group board rules so you don’t get kicked out! Put a 1000 x 1500 image on each one of your blog posts. Use big text on these images and make them super pretty. Pin these images to your boards. Aim to pin at least 25 pins a day and pin 50% your pins and 50% other people’s pins. Bonus! You can use Tailwind to schedule your pins ahead of time. This tool is a huge time saver and super cheap. If you enjoyed these tips, check out my post on How to Schedule Pins with BoardBooster. Also check out: 15 FREE Resources I use to grow my blog. You have to start thinking of your blog as a business and sometimes you have to put a little bit of money into your business to get something out of it. I would recommend at least setting up an email list through ConvertKit. Email lists allow you to capture the readers that come to your site so you can continue to interact with them and eventually bring them back to your site. Email lists allow you to grow a community of readers and to increase your potential income. Besides an email list, I also recommend using a paid theme for your blog. Paid themes look more professional and are also reasonably priced for the value you get. This blog uses the WellnessPro Studiopress theme and it was less than $100 for the theme. Check out this post on all of the tools I use to make money on my blog for the complete list of tools I use. You can get paid to promote your favorite companies on your blog by linking to products in posts or putting banners and ads in your sidebar. I recommend signing up for FlexOffers (click become a publisher to sign up). You can then search for your favorite fashion, fitness, health, or other products and start promoting them on your site. Affiliate marketing is a great way to make money by telling others about products you love. When people click on the links and purchase a product, you get paid a small amount of money. For example, if you are a style blogger, you can put up a picture of your outfit and link to all of the brands you’re wearing. If a reader clicks on one of the links and makes a purchase, you get paid a small amount of money. I saved up for the Making Sense of Affiliate Marketing course and highly recommend it. The course takes you step by step through the process of making money on your blog through affiliate marketing (linking to products and making a commission). Michelle, the creator of the course I took, makes over $100,000 a month on her blog. The course is self paced so you can work through all of the materials whenever you have time. I made my first dollar on this blog shortly after signing up for the course. You also get access to a Facebook group only for bloggers when you take the course. Everyone in the group is super nice and helpful. I post at least one question a week in the group and have been so impressed with the support I’ve seen from the other bloggers and Michelle. Check out the top college bloggers below for inspiration and ideas. Maybe you’ll be on the list soon! Lifestyle and fitness blogger Laura Shaw. Fashion Blogger Julia Engel – She started her blog in college. Jacklyn and Becky – Two best friends who started a lifestyle blog. The Sophie Series – Sophie is actually a high school blogger! Chic in Carolina is a high school lifestyle blogger too! Do you want me to add your college blog to this list? Leave me a comment! I would add a small disclaimer to make sure that while you’re blogging about your life in college, make sure to keep your career goals in mind – if you want to work in fashion, they’re probably going to be a lot more flexible with what’s “appropriate” than an accounting firm, and that anything you write is even more public and searchable than on social! Signed, someone whose blog was once flagged in a job search, lol. It didn’t cost me the job, but I learned my lesson really quickly on that awkward phone call. It was also a long time ago, so they were likely more lenient than they would have been today! Haha that’s funny that they found your blog and mentioned it to you! I have an old blog floating around in some cache somewhere but no one has every mentioned it in an interview. I wonder if employers will relax their expectations now that this current generation has grown up with social media. Probably not anytime in the short term though – great point! I actually had a problem with the ‘college’ part of blog. I tried to start one, and then I kind of just post about anything I feel is important to me. :3 I have loved blogging! I can relate! Sometimes I change topics all over the place! It helps keep it more real though. Good luck with the blog! I recently started a blog myself to help improve my writing skills. 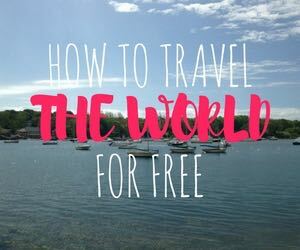 This article was very helpful!